Yosemite is one of the country's oldest, best-known and most-photographed national parks. It's a California icon, but I'm always surprised at how many people, including friends who have lived in California their entire lives have never been there. From much of the state, you can get a taste of Yosemite in a weekend, so why wait? This Yosemite trip guide will help you plan a two- to three-day getaway that takes in all of the must-see sights. Why Should You Go? Will You Like Yosemite? Yosemite National Park covers a large area in the mountains, but you can limit a short visit to just the Yosemite Valley and areas nearby. Yosemite is popular with nature lovers, photographers, and hikers. Families also enjoy camping at Yosemite and in the off-season, you can attend some fun food and wine events. Yosemite weather is best in spring and fall, and it's less crowded then. Frankly, this beloved national park can be more crowded in summer than Black Friday at the local big box store. If you want to take a summer trip, think about staying outside the valley. Or spend your time in cooler, less-crowded spots like Tuolumne Meadows. Glacier Point: Glacier Points views have inspired photographers from Ansel Adams to Moose Peterson. It's a short walk from the parking lot to vista points that you might otherwise have to hike hours to reach. To get there, take Hwy 41 south from the Valley and watch for the turnoff. Tunnel View: You can see El Capitan, Half Dome, and Bridalveil Fall all at once from this viewpoint on Hwy 41 south of the valley. The parking area is just before you get to the tunnel. 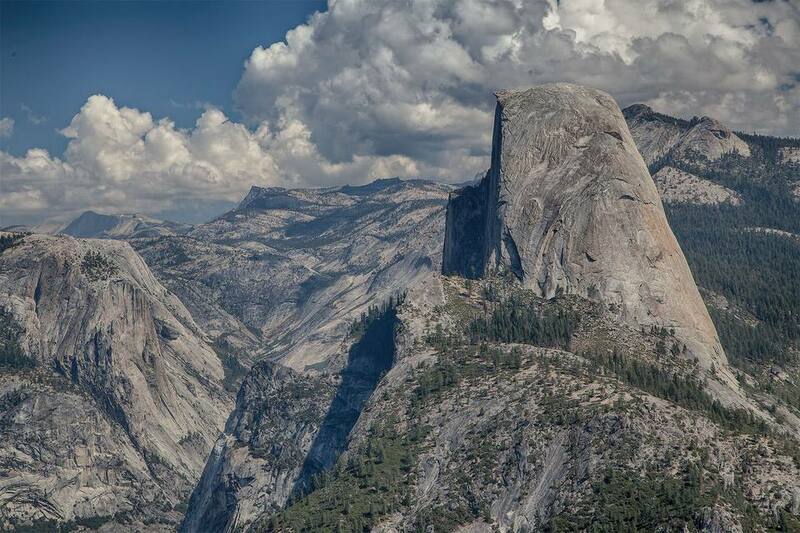 The Yosemite Valley is where you'll find Half Dome, El Capitan, and many other famous sights. You'll enjoy it a lot more if you stop and walk, even if it's only a little distance from the road. Take a Hike or opt for a nice, long walk on some easy Yosemite day hikes. For something more challenging, there's a complete list of hikes at the National Park website. Tuolumne Meadows is a great place to head on a hot day when the park is crowded. Take a Ranger-Led Tour: Check the Yosemite Today newspaper or ask at the visitor center to find out about tours during your visit. Watch the Sunset: From Tunnel View, you'll get a view of the entire Yosemite Valley. In the late afternoon, hang around to watch the sunlight play across Half Dome and El Capitan. Linger after the sun goes down and you see a rare red-tinted, alpenglow, which will be in the east shortly after the sun sets. Bracebridge Dinners have been an annual Christmas tradition at Yosemite since 1927. The hotel dining room transforms into a 17th-century English manor set up for a holiday feast, complete with entertainment. To have your pick of dates, make reservations the previous February. The Ahwahnee sponsors special events all year long, including wine and chef's events. Most of them require reservations. For the most beautiful approach to Yosemite, take CA Hwy 140 through Merced and Mariposa. The drive along the Merced River is a good warm up for sights in the Valley. Get around Yosemite like a pro by downloading an app. Find out about the different Yosemite apps available here. Don't bring too much food. Most hotels don't allow it in your room (particularly in the lodge). Because of bears in the area, it is not safe to leave it in the car. The best thing to do is to buy what you need at one of the stores and eat it right away or choose one of the several places to eat in the park. The Ahwahnee (now named The Majestic Yosemite) dining room is the park's most famous place to eat, but there are plenty of other options. At the lovely dining room at Yosemite Lodge, the quality of the photography displayed on the walls threatens to upstage the dishes on your plate. The hotel serves Sunday brunch featuring nine buffet stations, but it's so popular that reservations are a must during busy times. If the weather is nice, you can pick up makings for a picnic meal at Degnan's Deli in Yosemite Village. The most important thing to do when planning your Yosemite trip is to make your hotel reservations as early as possible. In fact, make them even if you aren't sure yet and pay attention to cancellation policies in case you change your mind. To keep costs down, think "camping." That doesn't mean you have to sleep on the ground, fight off bears, and do battle with uncooperative tent poles, though. It's possible to do Yosemite on a budget. Yosemite is 188 miles from San Francisco, 184 miles from San Jose, 174 miles from Sacramento, 212 miles from Reno, NV and 310 miles from Los Angeles. The nearest airport is in Fresno (FAT).